What Is a Sublime Landscape? What Is a Picturesque Landscape? Where Are They Found in Virginia? What did Thomas Jefferson mean when he reported “emotions arising from the sublime”? The explanation is that he had been reading Edmund Burke’s Philosophical Enquiry into the Origins of Our Ideas of the Sublime and the Beautiful (1757), which led the future president to search the Virginia landscape to find evidence of sublimity. The British statesman-to-be Edmund Burke offered a philosophy about the landscape that guided connoisseurs and artists in Europe and America for more than a century. He labeled “beautiful” those things that are smooth, varied in form, or delicate, and induce in us a sense of affection and tenderness—like a rose or the bend of a swan’s neck. More relevant to the painter were those powerful forces of nature and those elements visible in nature that threaten our self-preservation and make us aware of the futility of human arrangements. Burke considered “sublime” the cataclysmic natural forces—tidal waves, tornadoes, hurricanes, conflagrations. Also “sublime” are extreme conditions that threaten our existence—such total stillness, total darkness, and death. 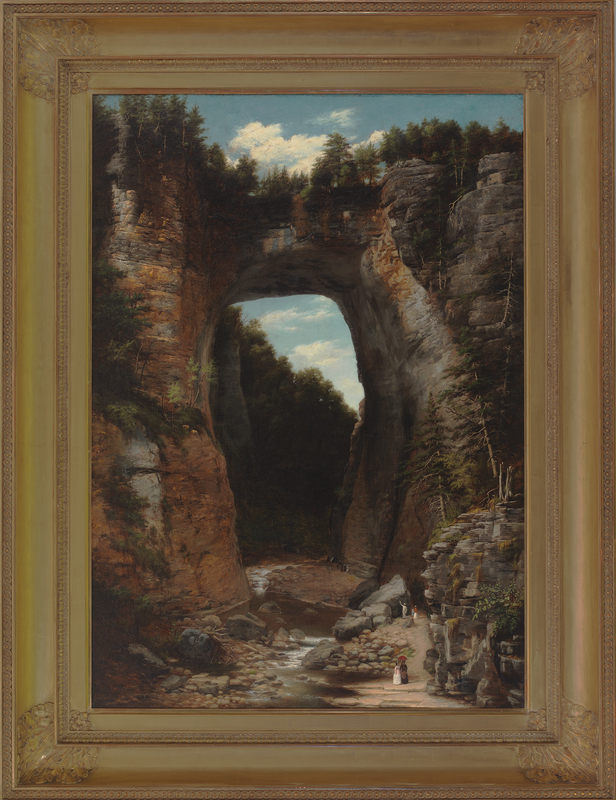 Jefferson found that a human standing beneath the towering arch of Natural Bridge or peering down over its edge feels physically dwarfed and intellectually taken aback. He argued that such a landscape should be visited and it followed that it should be replicated in paint for those not able to see it on location. We know today that Jefferson’s scene of “riot and tumult” was less the result of rivers rushing to the sea, albeit their effect over an immense period of time is not to be dismissed, but more so it was the result of powerful geological forces beneath the surface, 1,000 to 1600 million years ago. Mountains were formed when rocks were pushed westward over the top of bedrock by enormous forces generated when land masses to the east were squeezed together. 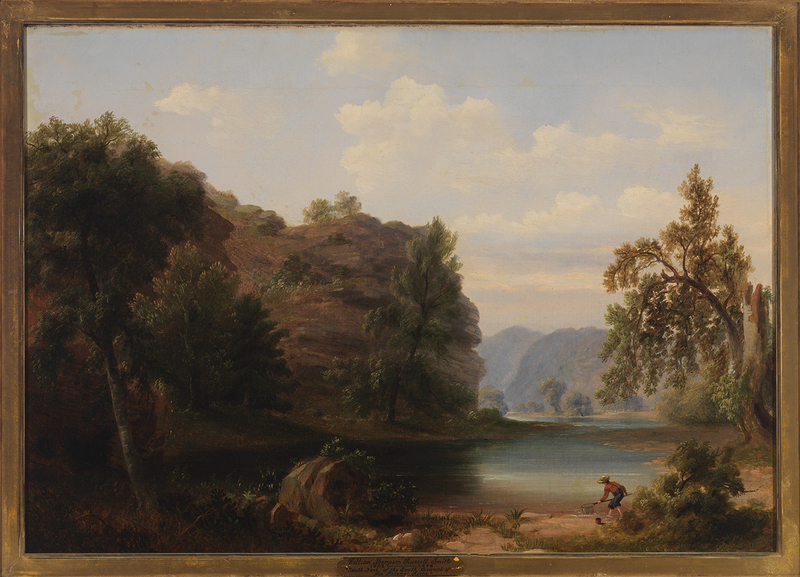 Near Harpers Ferry, 1870-80s, Andrew Melrose, bequest of Lora and Claiborne Robins, 2013.86.5. Melrose painted Harpers Ferry on a peaceful day, a decade after the Civil War had brought man-made destruction to the site. Jefferson no doubt saw Harpers Ferry at more dramatic moments, though probably less tumultuous than the times in 1936 and 1972 when hurricanes increased the quantity of water through the pass by multiples of 52 and 37. Those were unquestionably sublime moments. Several decades after Gilpin’s essay, Uvedale Price, an English Baronet and amateur scholar, rejuvenated interest in the subject with his Essay on the Picturesque (1820). He refined the term to mean like a picture with interesting elements that are well composed. One of his American followers, Russell Smith, accompanied a geological expedition led by William Barton Rogers of the University of Virginia. Smith sketched west of Harrisonburg (close to the present West Virginia line). In the field he developed an interest in accuracy of detail and clarity of vision. However, when he returned to the studio to produce finished oil paintings developed from his drawings, Smith altered just about everything in order to transform his raw and honest landscape sketches into picturesque views—to make those images more “like pictures”—to turn landscape into art. South Fork of the South Branch of the Potomac River, about 1848, Russell Smith, bequest of Lora and Claiborne Robins, 2013.86.1. Along the bottom of drawings that he made in the field, Smith jotted down notes that are evidence that he strove to be entirely accurate. However, in this finished oil painting derived from one of his field sketches, the artist altered the types, positions, and heights of trees, and he shifted landscape features in order to construct what he considered to be a proper finished painting in the tradition of the Picturesque (“looking like a picture”). Artists in France flocked to the village of Barbizon outside of Paris to look passionately at the changing moods of nature as they searched for traditional values and a simpler rural past. 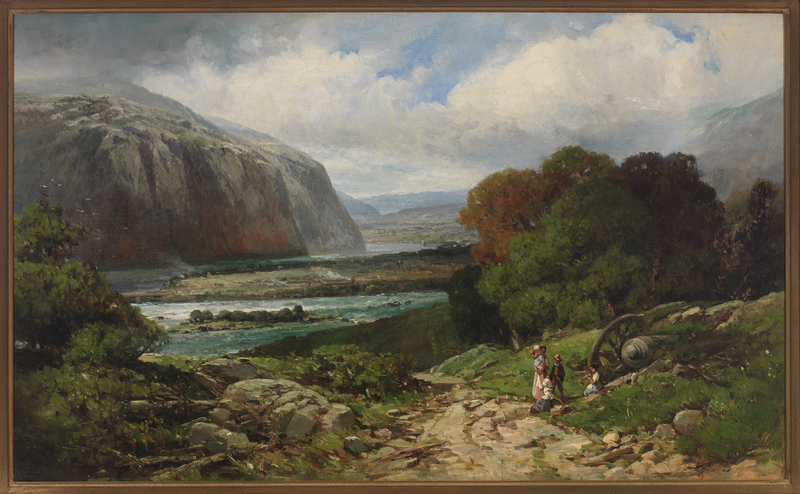 They believed that their picturesque landscape paintings would inspire proper values in viewers. Richard Norris Brooke of Warrenton, influenced by the Barbizon artists when he studied in Paris, returned to Virginia to look for picturesque scenery that he could paint that would offer inspiration and renewal. Virginia Scene, about 1910, Richard Norris Brooke, Virginia Historical Society, Lora Robins Collection of Virginia Art, 1996.28.6. Brooke found picturesque landscape in northern Virginia. In an age of urbanization and industrialism he looked to find spiritual recovery in the beauty and cyclical patterns of nature. More picturesque scenery is found in the Valley than in any other part of Virginia. It is there that landscape painters have most frequently traveled. This should be no surprise because from the start the travel literature has beckoned readers to visit this area of bountiful harvests, rainbows, ideal weather, and tranquility. One artist who answered the call was Alexis Fournier, a Minnesota painter who had traveled to Paris in 1893, and who later brought the French Impressionist style of painting to the idyllic setting of the Virginia Valley. One of his works is among a group of picturesque landscapes from the Valley that are on display at the Virginia Historical Society in our Landscapes of Virginia exhibition. Come see them! 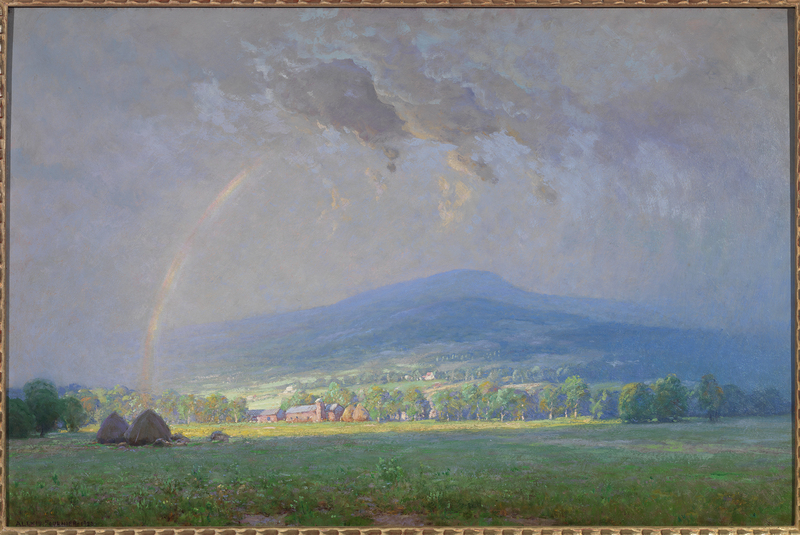 The Passing Storm, Shenandoah Valley, 1924, Alexis Fournier, Lora Robins Collection of Virginia Art, 1996.172.2. 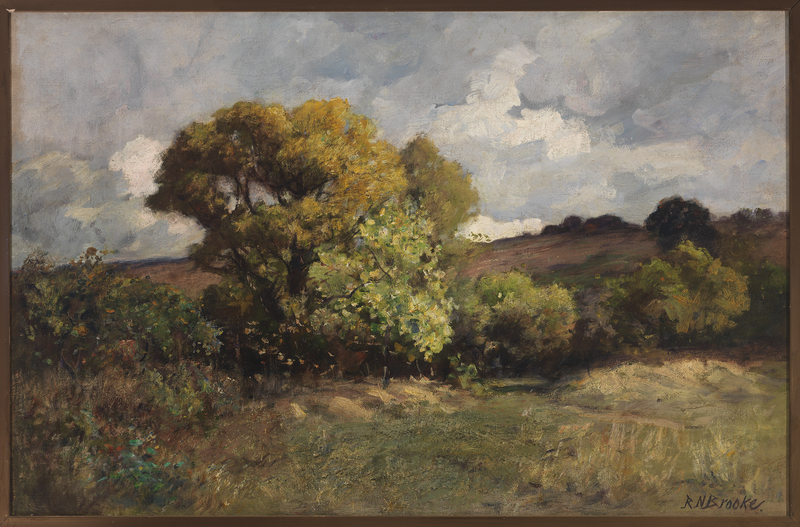 Fournier arranged landscape elements to make this scene “look like a pleasing picture,” then he managed to convey his emotional response to the light, the coolness of the atmosphere, and the warm, radiant color that he saw in this setting—which is somewhere in Rockingham County or farther north. Visit the VHS Pusey Museum Shop to view a selection of merchandise related to landscapes in Virginia. William M. S. Rasmussen is lead curator and Lora M. Robins curator at the Virginia Historical Society.